You know how it is when you go through the airports and you see flights to interesting and unusual places? When you pass the gates to places like Geneva, Budapest, Venice, Barcelona or Dubai? And you wish that you could just drop everything and go get on one of those flights and fly away to one of those exotic destinations? But instead you are actually going to Detroit or Cleveland? (No offense, citizens of Detroit and Cleveland!) Well, this time we got to do the cool stuff. “Oh, there’s our flight, the one to Vienna. And then we catch our connection to Sofia . . . It all started in the summer of 2002, with an E-mail from Bulgaria. An Event Rider there was looking for a market for his Event horses, and he urged me to come to see them. About fifty E-mails and a year and a half later, he finally talked me into it; I decided to take the plunge and go to Bulgaria to check out the horses. My friend and colleague, Natalie Hollis from Water’s Edge Farm in Maryland, accompanied me on this trip. Most of our friends thought we were nuts. “You’re going where? To Bulgaria? To look at Horses?” But I figured, best-case scenario, I go over and find nice horses, make a good business contact, and have a great new source of quality Eventers. In the worst case, well, we make the trip, get kidnapped, and are never heard from again. But hey, that probably wouldn’t happen, right? At least we would get an interesting vacation to a part of the world we would probably never have gotten to see otherwise! Natalie had ordered a guidebook to Bulgaria; so armed with important knowledge from this useful source, off we went! Aside from this source, the only real information we had on Bulgaria consisted of vague memories from Saturday Night Live, back in the early eighties, when Steve Martin and company did the skits about ‘The Wild and Crazy Guys, from Bulgaria!’ And there was some debate about that, as my sister said they were from Czechoslovakia! We had our first adventure before we even left Dulles Airport. After going through a security line that stretched all the way across the airport, with my artificial knee setting off the metal detector as usual, we proceeded to our gate. Two policemen were loitering around the check-in counter near where we were sitting, apparently waiting for a particular man to come and check in. I don’t know what he had done, but when he arrived, they handcuffed him, searched him thoroughly, (and I do mean THOROUGHLY, I had never realized that a body cavity search could be conducted without removing the clothing!) and dragged him away through the security door. Off to a good start! As usual, the over-night flight seemed endless. The plane was full, we couldn’t get any sleep, and we were exhausted by the time we reached our destination. We changed planes in Vienna and caught the morning flight to Bulgaria. We arrived in Sofia, the capital city of Bulgaria, in the early afternoon. The man I had been corresponding with by E-mail, Ilian, met us at the gate, along with his friend Lilia, who was to be our Interpreter for the week. Finding them was somewhat of a relief, as we had no idea how to speak the language or navigate the roads of this country. I admit we’d had a few anxiety-based visions of wandering helpless around the airport looking for a Bulgarian/English dictionary! The weather that greeted us was lovely, sunny and fairly warm. Natalie and I felt we had made the right decision to bring only our mid-weight jackets, it was really quite mild. Little did we know that this would be the last time we saw the sun until our final day in Bulgaria! Ilian brought around our transport for the week, a large and fairly old van-type vehicle with writing all over the side of it. The Bulgarian language uses the Cyrillic alphabet, so we never did find out what it said! We piled all of our stuff in the ‘Tour Bus’, and off we went through the city. Sofia is quite a large city. There are many large square apartment buildings, about twelve stories high, with balconies where the residents hang their laundry. They are all just alike, and all somewhat in a state of disrepair. These apartment buildings are apparently left over from the communist regime when all of the housing was government owned, and they seem to be where most of the people live now. Most of the cars looked fairly old, and often quite beat-up. We saw many Russian Ladas; this brought me a strong sense of déjà vu, as I had owned a Lada one of the summers I spent in England, they brought back interesting memories! In most respects, as you drove through the city, it could have been a city anywhere in the world. But it was weird to drive through the streets and see signs, not only in a totally incomprehensible language, but also with an entirely different alphabet! Fortunately, Lilia spoke nearly perfect English, so she could answer all of our questions. We learned as much as we could about the country and the people of Bulgaria! We stopped by the Showground and saw a couple of horses in the stable; we were not able to watch them go, but we would see these horses later in the week. They looked quite promising! We had a cup of coffee in the stable bar, and then we set out on the long drive to the city of Rousse, which is about five hours northeast of Sofia. By now of course we were really tired, having not slept the night before on the plane. The Tour Bus was roomy, but bumpy and drafty, not really conducive to napping. Also, the accepted method of driving in Bulgaria seems to be somewhat, um, erratic, shall we say. I curled up in the back and tried to sleep, but every time Ilian hit the breaks I would go flying off the narrow seat! B.Y.O.T.P! This was an important piece of information we had learned from Natalie’s book. Bring Your Own Toilet Paper! When we stopped at a gas station for a pit stop, we found that this was very good advice! What we didn’t expect was, it might have been handy to also bring your own toilet. We found that in many of the older buildings, the restrooms consisted of a hole in the floor, with two footprint-shaped markers on either side of it! Not only that, but to add insult to injury, there was often a person collecting money at the restroom door! We eventually arrived in the city of Rousse, and checked into the Danube Plaza Hotel, a very upscale (at least for Bulgaria) hotel in the center of the city. We immediately learned something about the differences in freedoms in this part of the world compared to our own; when we checked in to the hotel, we were expected to surrender our passports! Ilian and Lilia took us out for our first Bulgarian meal. 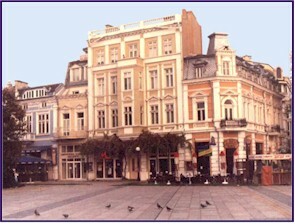 We walked across the city square, surrounded by huge old buildings with lovely but crumbling architecture. 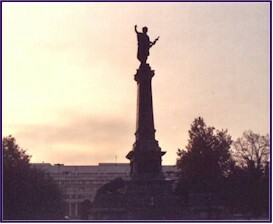 In the center of the square was a tall and magnificent statue; it was called the Monument to Freedom. We were quite exhausted by this point, and in our sleep-deprived state, we not only had no idea what to order from the menu that was written all in Bulgarian (Lilia ordered for us), but afterwards we hardly remembered what we ate. The evening took on sort of a surreal quality, to the point that when the waiter came after we had eaten and cleaned up the crumbs on the table and in our laps with a Dust Buster, it didn’t even seem that strange! Then back to the hotel. It was, like most of Bulgaria as we were to discover over the next week, an interesting mix of old and new. The lobby, bar and restaurant downstairs were very modern and quite fancy. But when you stepped into the elevator to go upstairs, you sort of stepped back in time. And I mean that quite literally; the elevator itself was archaic. It was tiny, slow, and did not have power doors. By the time we wedged our luggage and ourselves into it, there was barely room enough to maneuver to push the floor buttons. The door had a glass window, so we could, somewhat disconcertingly, watch the floors go by. When we arrived on our floor, we found ourselves waiting for the elevator doors to open; but of course they didn’t, you had to push your way out. The corridors were plain but clean; as evidenced by the vacuum cleaner left sitting in the hall near our door! The room itself was quite adequate, though not fancy. The beds were firm (very firm), and I am not sure what the pillows were stuffed with, but they weighed about 30 pounds apiece. The heater worked well; so well in fact that we had to open the window to keep from suffocating, as there was no thermostat or control switch in the room! So all in all, we were pretty comfortable. The bathroom was very luxurious; it had not only a sit-down toilet, but supplied toilet paper as well! It also had a very interesting shower. There was no bathtub or shower stall; just a drain in the floor, and the shower was right in the middle of the bathroom, so when you turned it on it doused the sink, the toilet, the towels and the precious toilet paper if you weren’t careful! Also, the bathroom vent led into the room next door, so you could hear everything your neighbor did! In our state of exhaustion, we went to bed and slept like logs until the next morning, right? NOT! By now it was well after midnight, but our bodies thought they were still on U.S. time, a seven hours difference. So we tossed and turned and hardly slept at all, until of course about a half hour before the alarm was to go off! Today was Natalie’s birthday! Her 29th and last one, she said! The phone rang obscenely early, as by now our bodies thought it was midnight. When I answered the phone someone spoke rapidly in Bulgarian. It may have been our wake-up call or it may have been someone saying we had won the Balkan lottery . . . While I took a shower Natalie watched Popeye the Sailor Man on TV, in Bulgarian! Then we went out walking around the square, and enjoyed the Monument to Freedom in the dawn light. It was a cold and dreary day, overcast and damp. Lilia met us in front of the hotel, and we went to Ilian’s lovely stable to see his horses. He showed us his youngsters, and we watched him ride his lovely experienced Event horse, Dim. It was a delight to watch this talented and beautiful horse go; the video of Dim that Ilian had sent me was largely responsible for my decision to come to Bulgaria to see the horses! We also saw a demonstration of some of Ilian’s younger students riding and jumping, including his talented daughter Veronica, on her pony Penelope. They were very impressive! We also had the opportunity to meet Marie, Ilian’s assistant trainer at the stable, and one of the few women we saw riding in Bulgaria! Ilian showed us some of his young horses as well; they were of excellent quality, definitely ones to check out on our next trip. We thoroughly enjoyed our trip to this stable! 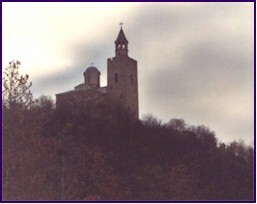 We left the stable and went to see the castle of Tcherven. 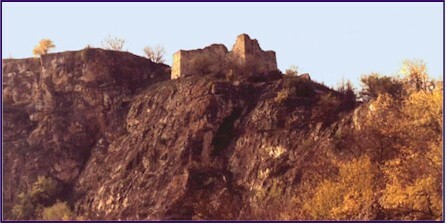 It is a fabulous ancient stronghold on the top of a very tall and sheer-sided hill, surrounded by a deep river gorge. We climbed up 233 steps (but who’s counting! ), and then further negotiated a steep upward slope to the top. From that lofty position, we could look down over the winding river and the green valleys on all sides. The place had a lovely sense of peace and tranquility, despite the fact that it was surely built as a fortress of protection from enemies. As we drove along, it was really interesting to observe the scenery along the way. It seems that almost everyone lives in either the cities or the villages. We saw lots of farmland and crop fields, but few actual farms or farmhouses. There was city, then country, but no in-between. This is probably a throwback from Communist times, when the farms were all Government owned. We passed many peasant-like people along the roads. We saw sturdy-built women wearing work boots and shawls, with scarves over their heads. Older men wearing balaclavas against the cold, tending a small herd of sheep, goats, or cattle grazing along the side of the road. Sometimes you would see a man patiently standing with just one cow! We saw farmers out harvesting their crops with hand tools, and putting the produce into small carts, pulled by a pony or donkey. 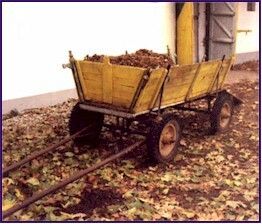 They would travel miles with these pony carts, to take the farm produce to their home in the village. These people looked very familiar to me; they were like the peasant folk straight out of novels and movies of early twentieth century Russia. I thought we had truly traveled back in time! It was interesting to talk to Lilia about the way of life in Bulgaria. I asked her about how the quality of life had improved in the last ten years or so, since the downfall of the Iron Curtain and the end of the Communist Regime. To my surprise, she said that things had not improved; that most of the people had less now than they did under Communism. This was really a shock to me! I think that in America we are taught from grade school on to believe that Communism is an evil thing, and I somehow had a vague notion that when the Iron Curtain fell, the people would be celebrating their new-found freedom in the streets. But this was not necessarily the case! I was amazed to learn that many of the people felt that they are less well off now than they were before, and that giving up freedom had been a fair price to pay for a more secure lifestyle. It really makes me appreciate the liberty that most Americans take for granted! We stopped back in Rousse and visited the Photo Shop owned by Ilian’s brother, Krasimir. He showed us his gallery, and a lovely display of photographs, a study of the faces of horses and riders. He most generously gave Natalie several lovely photos from this display as a present for her Birthday! Then they took us out to lunch. Everyone was treating us like Royalty! Natalie had noticed the calendar in Krasimir’s Photo Shop; the date we arrived was circled in red. Coincidence? We weren’t sure. We went back to Ilian’s stable, and toured the cross-country course; it was quite imposing! The jumps there would require a bold and clever horse. The fences were reminiscent of what the sport was like here thirty years ago. The materials used were often small and somewhat flimsy; this made the degree of difficulty higher. I would want to have a lot of trust in my horse before attempting most of these obstacles! There was also a racetrack there; it was an oval sand track with bushes lining it, but no fence or rail. It was quite overgrown and looked long disused, so I was surprised to learn that several race meets are held there each year. There was an ancient looking grandstand, with goats frolicking up and down the bleachers. Ilian jumped Dim for us in the late afternoon; he was most impressive. By the time Natalie rode him we were losing the light, but an incredible full moon was rising above the horizon. She had a lovely moonlight gallop around the racetrack on this beautiful horse, a great way to end the day on her Birthday! We went to dinner at a buffet-type restaurant; this was great because we could see what we were ordering! Ilian insisted on paying for our dinner, it would be our turn next time! After dinner, Ilian took us back to his house to see videos. He had tapes on many of the horses we would be looking at during the next few days; this was a great chance to see some of the horses in competition. It seems like practically everyone in Bulgaria smokes. This doesn’t particularly bother me, but I had a cough from a cold that I was just getting over. So while we were watching the videos, every time I coughed, they thought it was because of the smoke, and someone would get up and open the window for ventilation. Then we were freezing to death! Finally we returned to our room, after waiting in vain for the elevator doors to open, and passing the vacuum cleaner, which was still sitting in the hall. We made a brief phone call home to let them know we hadn’t been kidnapped yet; this ended up costing us $45 for three minutes! We spent the rest of the night restlessly attempting to sleep. In the morning Ilian and Lilia loaded up all of our stuff in the tour bus (they insisted on carrying our suitcases for us! ), and we all set off for the town of Arbanasi. The drive gave us a good chance to see more of the countryside. It is really quite a beautiful county, not unlike Virginia. It is very green, with rolling hills and mountainous ranges. There are many lake and small rivers, and some beautiful forests. There are large areas of farmland, often divided up into smaller sections, where each family can work a plot of land. Again, we saw large numbers of people gathering crops using the pony carts. It was mostly older people that we saw doing the farm work; Lilia explained that most of the younger generation doesn’t want to farm; they have gotten an education and seek an easier life. We also learned something about the economics of the country. Many people live below what is considered the poverty level, and the average wages are around $150 per month. Of course, the cost of living is much lower than we are used to, but still! We also learned that it is customary for foreigners and tourists to be charged much higher prices for goods and services, such as hotels and food, than what the Bulgarian people would pay. I thought it would be interesting to compare horse related costs in Bulgaria to our own, so I asked Ilian some questions regarding prices. We found out that to board a horse costs about $100 per month. A typical pre-prepurchase veterinary exam runs around $60. A private riding lesson is $5! I tried to find out what it costs for one shoeing by the farrier, but he didn’t really understand that question; it turns out that almost everyone just shoes their own horses! 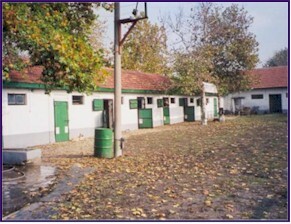 We went to the Arbanasi stables. This was a fairly large stable, and the site of one of the leading Events in Bulgaria. There was a large sand ring where we were to ride the horses, but 75% of it was under water, it looked like a big lake! We looked at quite a number of really nice horses at Arbanasi. I had given Ilian a very long list of tough requirements, and all of the horses that we were shown met those specifications. I was quite surprised by how nice the horses were! They were quite similar in type and quality to the horses in Ireland. Leading up to this trip, my feelings about the practicality of it had fluctuated. Half of the time I thought I was insane. I thought I would probably travel halfway across the world to see horses that were not up to standard. But the other half of the time I thought, why not go and find out? Several of the horses we saw that day were very much of interest to us. The trip was starting to seem really worthwhile! 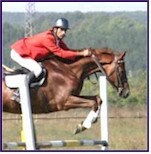 After riding in the ring, we would take the horses out for a gallop on the cross-country course. At one point, I was galloping up a long hill on a lovely mount, and I was really struck by the circumstances. “Here I am”, I thought, “galloping across Bulgaria. How surreal is this?” I didn’t want to stop. I learned a Bulgarian word on this day: galup! (pronounced ga-loop, with the accent on the second syllable) It means to canter. This turned out to be the only Bulgarian word I learned the entire trip! It was very cold and damp, and we became progressively colder as the day wore on. Why was it that we hadn’t brought our heaviest down jackets? By the time we were done looking at the horses, we were so frozen that we could barely move, and our feet were like ice cubes. Ilian took us out for a late lunch, where we warmed up somewhat with a bowl of hot soup. The shops all had excellent soups, and Lilia showed us the Bulgarian custom of putting vinegar in the soup. It sounds weird, but it was really quite good! They also served excellent breads, but butter was not served with it. We always made a point of using the restrooms (or WCs, as they are known in Europe) at lunch, or anywhere that we went where they were indoors and had actual toilets! You never knew how far it might be to the next civilized facility. We then went to another stable, this one was privately owned by one of the wealthiest men in the country, and it was very fancy. We saw more horses there, and it didn’t take long for us to be frozen again! It was dark by the time we finished riding. By now I was seriously cold; it really took me a while to warm up! Arbanasi is a lovely village, with stonewalls lining the narrow street that wound its way up the hillside. Ilian had rented a cabin; the four of us stayed there for the night. We went into the town of Veliko Tarnova and had dinner at a nice Italian restaurant. Once again, Ilian insisted on paying for dinner. We argued with him that it was our turn to treat, but he was unyielding on the subject. We were getting a bit uncomfortable about that, as he had paid for every meal we had eaten so far, and wouldn’t let us even so much as buy a round of drinks. He even bought us flowers at the dinner table! Back to the cabin, for a few hours of sleep. It is amazing how much difference the seven-hour time difference makes, compared to the five-hour change when I go to Ireland! I make the Ireland trip often, and usually adjust to the time difference in a day or two. Natalie and I were both finding the seven-hour change much more difficult! Click here to read Part Two of our Bulgaria Adventure!